Blogging has been a great blessing to me in my life and it has enriched my days so much. I love “visiting” my friends in the blogging world everyday and I have made so many connections that I truly cherish. The rules state that you pass this award on to four blogging friends and one new blogging friend that you have discovered who is in a different country than where you live. 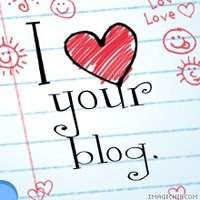 I have also received the “I Love Your Blog” award from Alison at EleanorBlog a few days ago. I am so grateful to her for this. She has a beautiful blog that I just love visiting. Please drop by and see her. Then this morning I woke up to find to my surprise that I had been given this award again by Sharon at The Artist’s Muse. She is an artist and has a lovely blog too. Please check her out. 3) And let the 7 other bloggers know that you have tagged them. Thanks again to Mike, Alison, and Sharon for my awards. Yep! 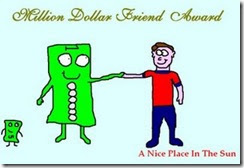 You are a great blogging friend so I had to give you this award. You have a wonderful day! Wow! I'm honored! Congrats on your awards and thanks for mine! I'll get my list up later today. Glad you enjoy the blog! I am loving yours, as well! Yea you and thank you for the list of referrals. I love checking out new blogs. Congratulations on your awards. And, thank you so much for passing it on to me. I always consider the best part about blogging is the friends that you make and I'm very thankful to consider you one of my friends. Congrats on your awards! I really appreciate your blogging friendship as well. I feel honored that you're passing an award on to me. You have done a wonderful job in helping us get to know more about your surroundings in England, and it's fascinating! I don't know if you've seen it yet, but I've given you a permanent link on my site (left hand side) in appreciation of all that you are and all that you bring to the blogging arena. In addition, I'm sending you 1000 EC credits. I'm glad you liked the award that I sent you. :-) I'm so pleased that my blog has given you a flavor of what it's like here for me and I'm humbled that you gave me a permanent link on your site! Wow! Thanks so much for the ECs. You are a star! :-) Your encouragement is so great and I will continue to highlight your wonderful site. Congratulation Dori :) you really deserve it! Your blog is one of my faves, the site looks great and you have interesting content. Thanks so much for passing the award to me, wow, I'm so honored!! I really appreciate it and will follow the rules when I pass it along. Good luck and best wishes with your site in the future. Congratulations to you & thank you from me! I have been enjoying your blog. It really is amazing how blogging connects people. Aww, Dori, thank you for the award. This is so sweet of you! m glad you enjoyed the award. Big Time Hugs and God's Blessings from my house to your House. Thanks for the congrats! I'm so glad you enjoy my site. :-) I love yours too and you so deserve the award. I will be visiting often. I truly love the award you gave me. :-) Hugs to you and blessings too. Congratulations in your awards, you absolutely deserve them! And WOW I am really honored that you passes one on to me!!! Thank you so much! good blog this is . i think u r good in blogging .keep it up. HI, Dori. I just found you on the Expat blog website. Great blog and congratulations on the awards. I'm an American who has also been living in the English countryside (west Berks--we're neighbors!) for 14 years now. Still, it's not like I'm mistaken for being a native. Check me out if you get a chance. Oh, thank you so much! I am truly honored! Thanks for stopping by Netfandu. I'm so glad that you like my blog.